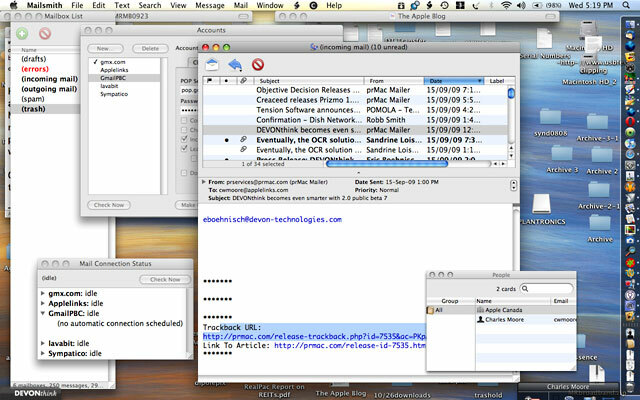 I have to admit that I never paid much attention to the Mailsmith email client in the past. I've been aware of it for years as an extra-strength and very expensive application designed for Macintosh users by BareBones Software - developers of the formidable BBEdit professional-grade text editor and its excellent TextWrangler freeware companion program. I had no doubt that Mailsmith would be a good email client, but selling for $100 - more than twice what other commercial software email clients - such as classic Eudora - sold for, and $100 more than Mozilla.org's Thunderbird, could it be that much better? I couldn't imagine so. However, BareBones Software recently announced it had transferred ownership of Mailsmith to Stickshift Software LLC, which is releasing Mailsmith 2.2 as freeware. Stickshift Software is distributing the program and providing online support. The philosophy behind Mailsmith isn't likely to change much, since Stickshift Software's owner and principal, Rich Siegel, is founder and CEO of BareBones Software. He says that henceforth Mailsmith will be strictly a labor of love, noting that he's in the unique position of being able to support the program for others who use and rely on it, and that his new company's sole purpose is to provide a home for Mailsmith, allowing him to continue to focus on his work at BareBones Software, which remains his first and highest priority. Anyway, now that it's free, I was intrigued enough to download a copy of Mailsmith, and I have been trying it out. Things didn't begin auspiciously. I tried importing my several hundred megabytes of archived emails from Eudora, which seemed to go okay, although it took a very long time. But when I tried to open the archives, I was presented with messages containing indecipherable text. Not sure what that's about - obviously not a success. Trying again, I went with a clean install and no imported data, and then I configured account info from scratch. One of the things I liked about classic Eudora was its multi-window user interface, and I discovered that Mailsmith has even more windows than Eudora. Indeed, perhaps too much of a good thing, to a degree that I find it a bit much. Like BBEdit, Mailsmith is more than a bit geeky. If you like monitoring and micromanaging every aspect of your email, this is the POP3 client for you (Mailsmith doesn't support IMAP). I suppose I could get used to it, but I've become a foot-dragging convert to the Thunderbird/Eudora 8.x interface philosophy since switching to them last winter. Mailsmith is powerful and feature-loaded - unlimited filter terms and actions, stationery, spell check as you type, a spell-checking dialog window, a powerful search engine, and text editing tools. Speaking of which, Mailsmith is a plain text program. It doesn't support rich HTML formatted email - even incoming email is displayed as plain text. Mailsmith also doesn't support S/MIME encryption and signing, but it does integrate with SpamSieve for Bayesian spam filtering. Not only is Mailsmith a scriptable mail client - giving you scripting access to checking mail, sending messages, and moving messages between mailboxes - it's also a fully scriptable text editor. Most AppleScripts written for BBEdit work in Mailsmith. Plus, because Mailsmith is recordable, you don't have to know how to program in AppleScript to create scripts of your own. To start recording a new script, just choose Start Recording from Mailsmith's Script menu. Messages are stored in a single database, which I don't like as well as the multiple mbox archive format used by Thunderbird and Eudora. It can (theoretically - see above) import message archives and contact data from Mail, Eudora, Claris Emailer, Pegasus Mail, and other mbox files. Mailsmith integrates with PGP 8 to offer secure messaging, and it supports TLS/SSL connections. Direct integration with SpamSieve provides easy to use Bayesian spam filtering in Mailsmith. Fir a complete features list, go here. Mailsmith can perhaps best be described as BBEdit for email. If that concept appeals, you'll probably like it a lot. Personally, I'll stick with Thunderbird/Eudora 8 - for now at least. Personally, I'll give it a rating of 2.5 out of 4. Supported operating systems are Mac OS X 10.4 "Tiger" through OS 10.6 "Snow Leopard". Mailsmith a Simple, Powerful, Spam Fighting Alternative to Apple Mail, Steve Watkins, 2007. Calls Mailsmith an incredibly efficient plain-Jane email client.